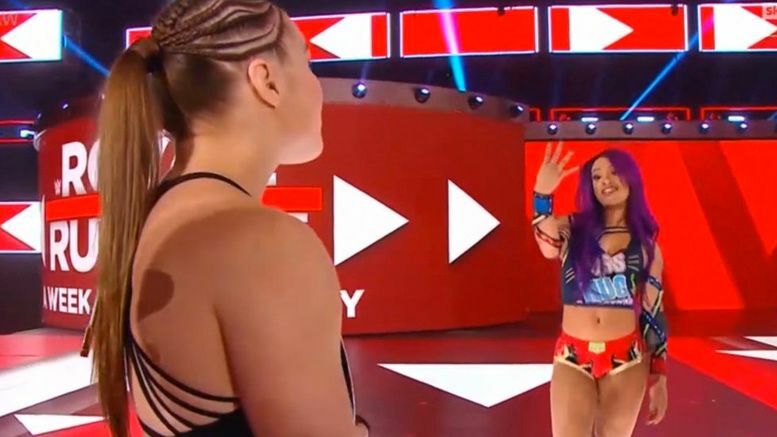 The Four Horsewomen vs. Four Horsewomen feud continued on Wednesday after Sasha Banks explained her reasoning for throwing up the iconic hand signal on RAW. As you may have seen, Sasha threw up the Horseman taunt on Raw this week while walking backstage and staring down Ronda Rousey. In an Instagram post days later, Banks said this was done because her version of the Four Horsewomen (which includes Charlotte, Becky Lynch and Bayley) is about changing the perception of women’s wrestling in WWE, not being a fan. The 4HW is about changing the perception of women’s wrestling in the WWE. Its about walking into an arena full of people, including some of the people in the back, who’s expections are lower than low, and knocking them on their asses. Showing the whole world that ” I was born to do this ” isn’t some catchy line, but a promise to them from me, that as long as I have a breath in my lungs, I will never go less than 💯. That’s why I throw up the 4 fingers. You throw them up cause you’re a fan… That’s the difference between you and I [Ronda Rousey] after #RoyalRumble you can go back to sitting in the crowd where you belong. Sound off in the comments below and tell us which side you’re on.